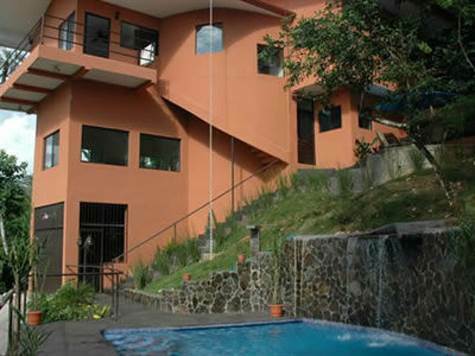 Located in the heart of Manuel Antonio with spectacular views, this two level home with three bedrooms and 2.5 baths is waiting for you. It's located at the end of a cul-de-sac, on a quiet residential street half-way between the town of Quepos and the famous beaches of Playa Espadilla and Manuel Antonio National Park. The rainforest, with frequent sightings of local wild life, surrounds the villa. The open concept design with an abundance of windows allows natural sunlight to flood in giving unobstructed views of the lush vegetation. The decor of the home is crisp and clean and although the home is spacious, a cozy and intimate ambiance prevails. Each of the three bedrooms have mini-split air-conditioning units and ceiling fans installed throughout the entire home. There are two queen size beds, two twin beds, as well as a sofa bed for additional guests. A fully equipped kitchen and complete entertainment center is all part of the package. This home also has a garage and off-street parking. The outdoor deck area boasts a private pool with a waterfall and outdoor shower, from which you can enjoy the rainforest and partial ocean views. There is an excellent vacation rental program already in place for those interested in capturing additional income. The villa is within walking distance of the areas finest cafes, restaurants, hotels and a supermarket, making it very attractive as a vacation rental, retirement home or seasonal residence.